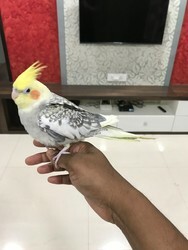 Hi, I have hand tame talking/whistling year old cockatiel for sale. I am moving out of country hence need to find a new home for my cockatiel. Very healthy and active cockatiels for sale. Plz call on 9689901262/ 9922415323 for more details.